Video production capabilities have advanced quickly over the past decade. Footage captured by an iPhone today easily bests the visual quality of most pre-2010 video recorders. Clarity in sound and picture are mere table stakes in today’s creation of video content. This often raises the question of why one needs to hire professional video creators. After all, can’t I just send an intern out for an hour or so with their cellphone? Can’t I just send an intern out for an hour or so with their cellphone? The answer is yes… and no. While there are definitely opportunities to capture “of the moment,” short-turn social video (which we deem the low end), deeper storytelling from the pros is sometimes required (aka the high end). To help define the level of production investment that fits with each narrative and brand goal, we created the graphic below. Save this and refer back to it the next time you’re evaluating the cost-benefit on individual pieces of content in your video production strategy. Our brand spot for the Big Ten Conference is an example of a stand-alone high-end project. The brand spot is shown many times on television as well as living online and the representation of the conference to the majority of its public. A vignette from our LiveBig series for the Big Ten Network is an example of a mid-range project. It relies on sit-down interviews to push the narrative and exists as part of a much broader campaign. These also air on television and online, but receive less overall time in television rotation than the high-end spot. Another example from La Vida Baseball and the Baseball Hall of Fame and Museum is this footage we captured and quickly published. Largely unedited, this type of content is charming in its lack of polish, quickly posted, consumed and moved on from. 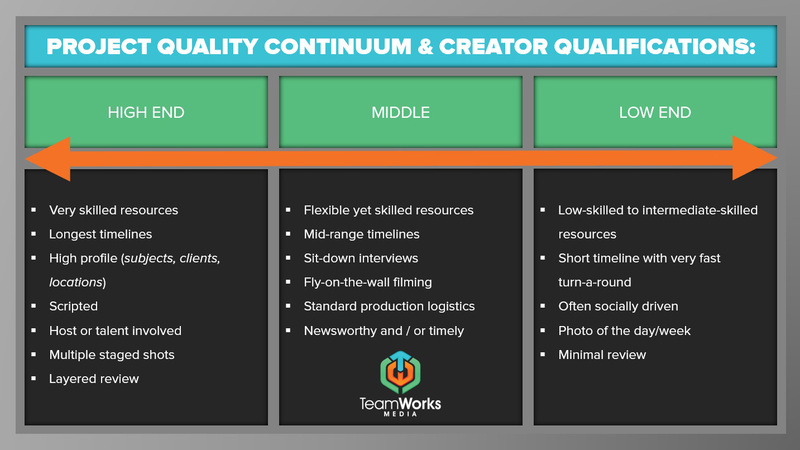 If you have any questions about what kind of video you should or could produce in each of these buckets, please email me at katie@teamworksmedia.com. I’d be happy to take you through the thought process in greater detail!